What books inspired you to go into #geriatrics or #palliative care? I just read a wonderful categorization of books about aging on Lousie Aronson's blog. She categorizes books about aging into five types: informational, memoirs, wellness and longevity books, general non-fiction, and literary works. My favorite category are the wellness and longevity books, you know the ones, about how if you eat enough "blueberries and kale" you will not "have to age or die." Louise graciously declines to state the names of such books, only noting that the authors initials are often followed by the letters "M" and "D". To that I would simply add that the author's name often contains the letters "O" and "z". In any case, I have been planning for some time to start a thread about books that inspired us to go into the fields of geriatrics, gerontology, palliative, hospice, and end-of-life care. Was there a particular book that pushed you along on your path to your current profession? Please list books that inspired you in the comments! 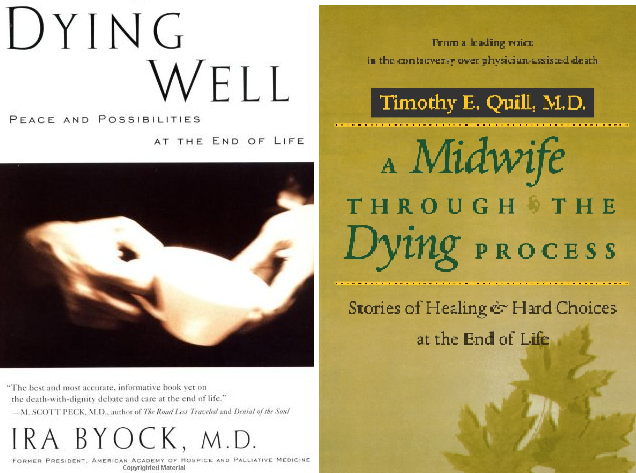 A Midwife through the Dying Process: Stories of Healing and Hard Choices at the End of Life, by Timothy Quill. Tim Quill presents 9 poignant stories of caring for patients who are dying, their families. He delves deeply into ethical issues that arise in the patient-physician relationship when patients are near death, including physician assisted suicide. These books are long form narratives that tell several stories in one coherent collection. Contemporary micro-forms of these narratives use Facebook, blogs, and twitter. Perhaps the next generation will recall being inspired by posts and tweets, rather than books. As a primary care physician you often know when you are seeing your patient for the last time before they die. You don't say good bye because you do not want them to feel as if you've stopped being there for them after such a long journey. And as you walk out of the exam room you gently lay your heart aside, just as you have hundreds of times before, and see your next patient. I really appreciated "Learning to Fall" a memoir by Phil Simmons, diagnosed with ALS at age 35. He writes eloquently about what he learned because of the disease. It made me think about how to try to create a safe space where people can learn the lessons of this "one wild and precious life" to use a phrase from Mary Oliver. Among others, these inspired me re "human condition". See also: "Five books to read before starting medical school" esp the comments.